Annual poverty report reveals one in five Israelis total are under rising poverty line, Zionist Camp slams Netanyahu for 'burying' citizens. National Insurance Institute Director Prof. Shlomo Mor Yosef on Wednesday submitted the annual poverty report for 2014 to Welfare Minister Haim Katz (Likud). The report shows a light increase in poverty among various groups compared to 2013, with the number of families living in poverty rising from 18.6% to 18.8%. 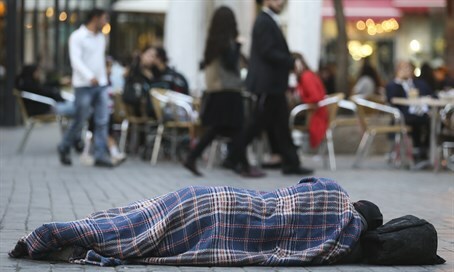 Poverty among the general public rose from 21.8% to 22%, meaning one in five Israelis live in poverty. Among children, that figure rose from 30.8% to 31%, indicating a third of Israel's children suffer poverty. In 2014, 444,900 families in Israel were living in poverty, comprising 1,709,300 total Israelis and among them 776,500 children. There was a 2.4% rise in the standard of living in terms of disposable income, and the poverty line rose in proportion. The Zionist Camp lost no time in condemning Prime Minister Binyamin Netanyahu over the figures. "The report shows clearly that while Netanyahu is telling citizens that we need to take the gas out of the ground, he leaves hundreds of thousands of children and citizens underground," said the party, in a barb over the controversial gas plan. "The prime minister who has already been in his post for seven consecutive years is doing that out of a conscious choice to neglect entire public sectors and to leave them behind. Bibi (Netanyahu) will continue to frighten Israeli citizens with Iran and Daesh (Islamic State), and in parallel to neglect the war for the welfare and financial security of Israeli citizens." The report also found that Israel's poor are getting poorer, with the measure for the extent of poverty rising by around 6% from 32.8% to 34.6%, while the measure of the severity of poverty - which gives greater weight to the poorer population - rose by roughly 10% among the general population. Poverty among haredi families in 2014 stood at 54.3%, and around two out of three haredi children were found to be living in poverty. In the Arab population, poverty among families rose from 51.7% to 52.6%. Among total Jewish children, the poverty rate rose from 20% to 21.6%, while the poverty rate among working families rose from 12.5% to 13.1%.